Why Shaklee? It just makes sense. If you’re looking for a business, and if you want to make money, then you want to be in industries that are growing. 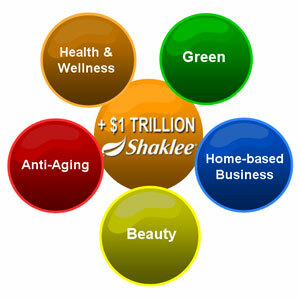 Shaklee is at the center of five of the fastest-growing consumer markets projected to grow by nearly $1 trillion over the next 10 years. Operating at the intersection of these 5 key trends positions Shaklee distributors for explosive growth in the coming years. With Shaklee’s strong foundation, our economic climate and these trends in your favor, there’s never been a better time to get going, especially with social media there to help!